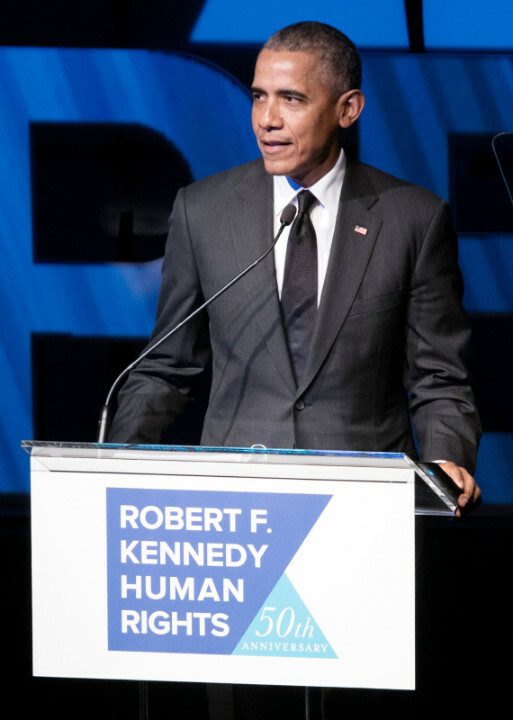 NEW YORK — Former President Barack Obama was honored with the Robert F. Kennedy Human Rights Ripple of Hope Award at a gala in midtown Manhattan on Dec 12. 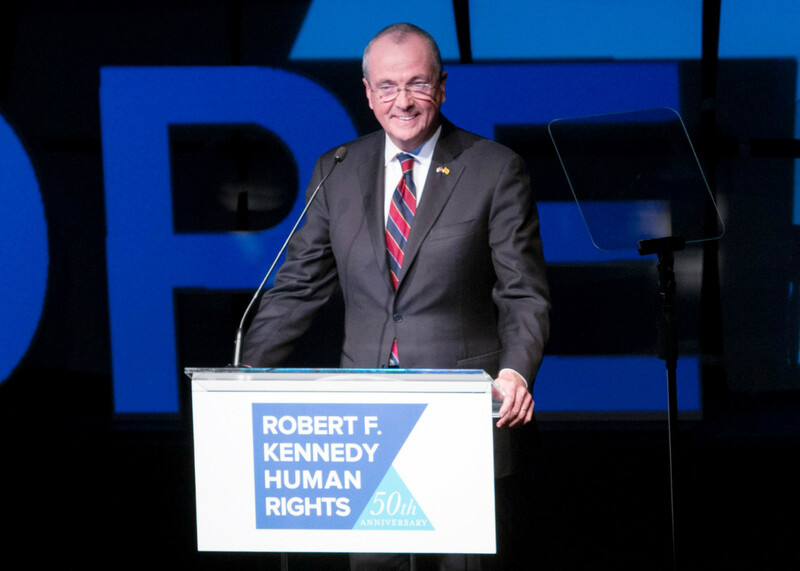 Also awarded were three other laureates, including, Humana CEO Bruce D. Broussard, New Jersey Governor Phil Murphy, and Discovery President and CEO David Zaslav. They awardees were each selected for their ongoing work toward a more just and peaceful world, and their lifelong work in the fight for social change, equality, justice and global human rights. Past recipients have included Bill Clinton, Hillary Clinton, Al Gore, Bono, George Clooney and Robert De Niro. The awards ceremony raised more than $6 million (Rs 42.6 crores), organizers said. The organization's president, Kerry Kennedy, presented the award, which celebrates leaders "who have demonstrated a commitment to social change." President Obama was recognized for his longstanding commitment to civic responsibility, social justice, service, and outstanding global and domestic leadership on a wide range of pressing issues. "I'm honored to receive the Ripple of Hope Award. Robert F. Kennedy inspired our nation to rededicate itself to social and economic justice for all Americans, and that critical work continues today. As CEO of Humana, I’ve committed our company to improving the health of our communities, particularly for older Americans. Access to quality health care is essential if we are to achieve the kind of world that Senator Kennedy dreamed of, and while our work is not done, every day we're making progress toward that goal,” said Broussard. The awards night was hosted by actor Alec Baldwin and was attended by over 1,600 guests, including TV Asia chairman and CEO Padma Shri H R Shah. Special guests included the organization’s president Kerry Kennedy, as well as family members Bobby Kennedy Jr and Caroline Kennedy. Others included, celebrity guests – Robert De Niro, Bianca Jagger, Jon Bon Jovi, Julianna Margulies, John McEnroe and many more. The evening raised over $6M and the proceeds will go toward providing critical support for the organization’s global social justice and human rights programs. This year also marks the 50 anniversary of Robert F. Kennedy's campaign for the White House. 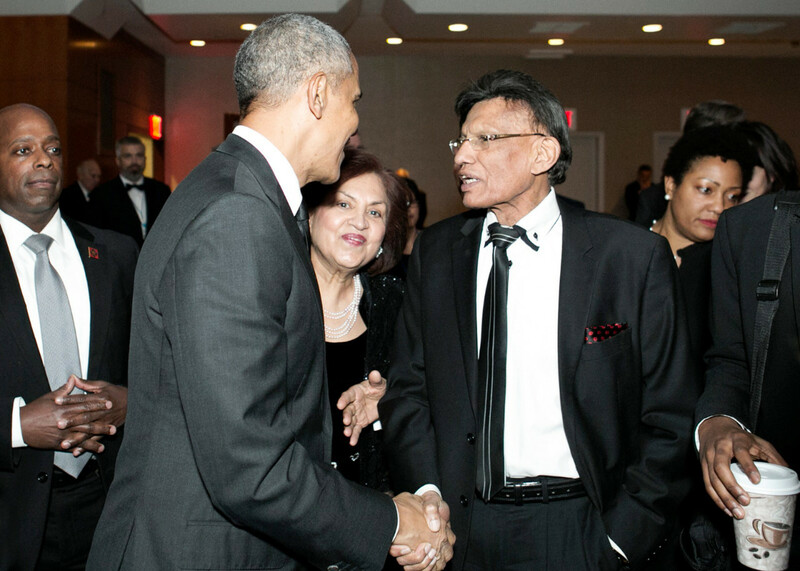 President Obama is greeted by TV Asia chairman and CEO, Padma Shri H R Shah. Mr. Shah discussed with President Obama about issues relating to global human rights. More than 1,600 guests attended the awards gala.